Crowne Plaza Fallsview / Blog / What’s New in Niagara? Brand new Fallsview dining experiences now at Massimo’s Italian Fallsview Restaurant inside the Sheraton on the Falls. When planning a visit to Niagara Falls this summer, make sure to add these exciting new attractions, dining, and shopping destinations to your itinerary. All are located in the heart of the city’s tourist district and will make any visit to the city into an unforgettable getaway. So, what’s new in Niagara? The Niagara Speedway is a brand new go-kart attraction on Clifton Hill and is North America’s largest elevated go-kart track facility! It features a concrete race track that runs through a four-story spiral and a two-tiered coaster style ramp. You’ll experience excitement and thrills as you race around the track, hitting speeds of up to 32 km/hr in your colourful kart. Tickets are $12 per driver and $4 per passenger for a 5 minute race. Drivers must be at least 58” to ride. Experience Niagara’s newest steakhouse restaurant at Prime Steakhouse inside the Crowne Plaza Niagara Falls – Fallsview hotel. Prime is a great place to experience succulent steaks, fresh seafood, hand-crafted cocktails, and other classic favourites. 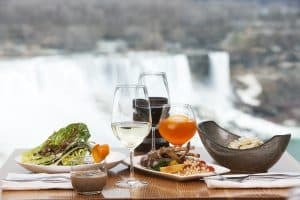 And the dining room directly overlooks the magnificent Niagara Falls, offering stunning views of the beautiful waterfalls to enjoy with your meal. Chef Massimo Capra has recently opened the brand new Massimo’s Italian Restaurant in Niagara Falls, featuring authentic Italian cuisine, award-winning wines, and amazing views of Niagara Falls. At Massimo’s, guests can indulge in amazing dishes like Rigatoni Alla Bolognese, Proscuitto Wrapped Stuffed Chicken, and Pan Roasted Mediterranean Sea Bass paired with wines from Niagara, Italy, and beyond. And after the meal, there is a delectable dessert menu waiting to be enjoyed, featuring Tiramisu, Panna Cotta, Milk Chocolate & Espresso Semifreddo, and more. Keep your healthy eating on track while visiting Niagara Falls at the brand new Freshii located inside the lobby of the Sheraton on the Falls hotel. Freshii will keep you energized with a nutritious menu of salads, smoothies, bowls, burritos, juices, soups, and wraps, and amazing signature items like turmeric juices, energii bites, and grain bowls. The whole menu is completely customizable and features innovative creations that make healthy eating fun. Eat and energize with a meal at Freshii and get ready to experience the very best healthy and nutritious eating that Niagara Falls has to offer. Discover one of Niagara’s newest and most exciting shopping destinations at Canadian Gifts & Marketplace inside the lobby of the Sheraton on the Falls hotel. This open-concept shopping destination features a number of food and retail stores including the Great Canadian Gifts Shop, Freshii, Starbucks, Sweet Jesus ice cream shop, Wine Rack boutique, and Niagara Vines Wine Bar. At the Great Canadian Gifts Shop, visitors can shop for souvenirs, gifts, clothing, and specialty Niagara-made products that will commemorate your stay in Niagara Falls. It offers a retail experience unlike anywhere else in the city and is the ultimate souvenir shopping destination, located just steps away from the Falls.